Home / What is Email Piping? and How to Set it up on WSDesk? Email piping helps you create tickets automatically from the emails sent to your specified support email ID. This way, your support agents are saved from the manual task of forwarding the emails to the help desk support ticket system. WSDesk offers email piping in its free and paid versions. You can set up email piping in different ways. Here, we will compile the available documentation to help you understand how each of these works. 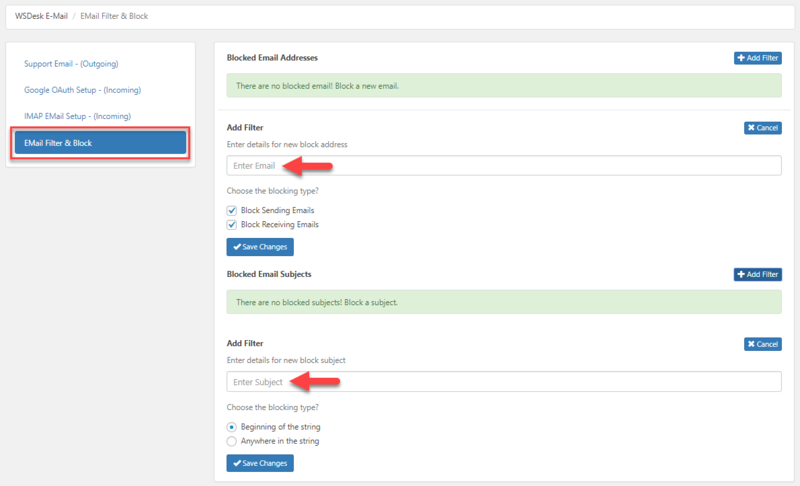 You can find the email settings on your WordPress navigation panel (WSDesk > Email). For email piping to work, you need to set up Google OAuth or IMAP. Setting up OAuth for your personal email account. Setting up OAuth for your G Suite account. You can also access these articles by clicking the ‘How to setup OAuth button on the bottom right corner of the settings page. Internet Message Access Protocol (IMAP) allows you to access emails stored on a mail server. If you are using an email service powered by a third party hosting service provider, you will have to contact them to set this up. Mostly, this step can be done on your CPanel, if the host uses the same. Enabling IMAP service in Gmail. When you are using email piping to organize your support queries, spam emails can create unwanted issues. WSDesk takes care of this very effectively. You can block all communication from the identified spam email IDs, or specify certain keywords on the email subject line, which you want to block.